Yes, once you see the all the cool things a router can do, you will want to learn how to use it and you will eventually fall in love! If you looked around my shop, you’d notice that I don’t have a ton of tools, but I think I have collected the most useful ones, the tools that will make my woodworking more fun and easier. On top of the list of my most versatile tools would be the router. 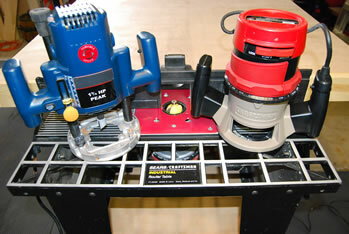 I have three routers – a standard router, a standard router mounted on my router table and a plunge router. Now you may ask, why three? Why not? Routers aren’t that expensive, starting at about $59 for a very decent one. To save time I can switch from one router to another depending on the task. For instance, instead of having to keep reattaching the router to my router table, I have one permanently attached. A router can shape edges, cut dovetails, cut grooves and be used for a variety of decorative edges. When I first started working with wood, I was happy just adding a small round-over edge to a tabletop or bench. Now, as my skills have improved from lots of practice – and plenty of mistakes – I like to add even more detailed edges. What makes a router, well rout?! A router relies on speed, not strength for its cutting power. The faster the bit turns, the smoother the cut. 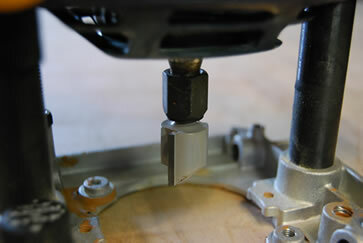 Threaded on the end of a router’s motor shaft is a collet that grips the bit’s shank securely. Collets are classed by the larger size of bit shank it accommodates: ½ inch collets are typically found on high powered, heavy duty routers aimed at pros, while a 3/8 inch and 1/4 inch collets are found on everything else. The weight of the router is also a factor, they can be from 3 ½ pounds to an 18 pound work horse. Weight is all about horse power, so the trick is to select one that’s powerful enough but will not break your back. For most work, select a router that has 1 ¼ hp, this is a standard weight and powerful enough to do most common jobs. It is the router most do it yourself stores sell as well, so it is easy to find. The best test for weight is to lift one and get a feel for the handle and the heft of the router itself, if possible test it at a local wood working store before purchasing. If it seems easy to handle and comfortable in your hands, this will be the router for you. If it seems heavy and akward, you won’t want to use it, it should become an extension of your hand. If you have room in your shop you may want to consider also purchasing a table for your router. When working with larger pieces or routing the same edge on a large number of pieces, using a table-mounted router saves time and is less taxing on the arm muscles. The guide on the table allows you to make straight, even passes and gives a factory finish edges. The plunge router is my personal choice for the most versatile router. I use it for a variety of pieces on which I need the bit to cut into a piece of wood from the center of the piece and not the edge. The plunge router has a motor that moves up and down on two spring-mounted posts, enabling the bit to be lowered – “plunged” into the work piece. 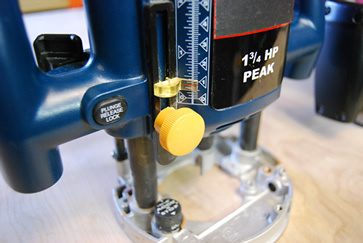 The base of the tool stays flat on the work piece at all times, making a plunge router easier to control and safer to use than standard routers. 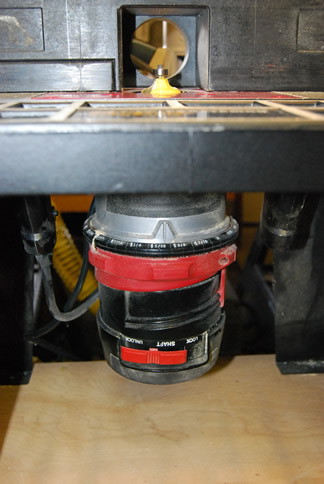 A plunge router has an adjustable depth stop. For deep cuts, the depth cut can be set in progressions and slowly remove material without trying to take out to much with one cut. You probably have seen a plunge router at a local fair or festival, where artist rout out the names of children and adults on a piece of wood. I haven’t even begun to use a plunge router to its full potential, but that will not take me long. Of course the hero of the whole deal are the router bits, they come in a variety of profiles and sizes, but unless they are sharp and free of nicks, they won’t cut properly or safely. Carbide bits keep a sharp edge longer than inexpensive high speed steel bits. But test the cutting edge of any bit before each use by brushing it lightly across your fingernail, if it doesn’t grab, it’s dull. Clean bits often, remove any pitch and grime with oven cleaner and a toothbrush. And store properly in a case or drill a hole in a block of wood and store shank first making sure to space the bits far enough apart so that they do not touch. Advance a router steadily into the work using light pressure only. Make several passes, because trying to cut a detail in one pass can cause the wood to burn and become unattractive. When viewed from above, the bit of the router spins clockwise. Move the router against the rotation of the bit. That way the bit digs into the work piece. To help determine the direction the router should move along the work piece use the “rule of thumb”. Place the router against the work piece, and then hold your right hand over the top, so your thumb points toward the edge to be cut. Point your index finger and it shows which direction to move the router. Another tip is to rout counter clockwise around the outside perimeter and clockwise around the inside perimeter. At corners, where the router base has the least support, slow down and keep one router handle over the work piece for improved control. 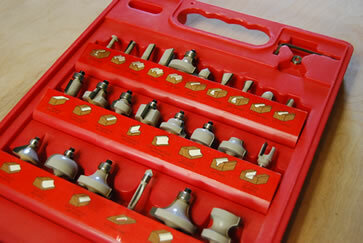 Always use a guide with a router, if the bit doesn’t have a pilot of its own, use a metal straight edge as a guide. Practice before making your finish cuts. I practice every cut that I make with a scrap piece of lumber. Always read the instructions that come with the router. Different motor types and bit sizes require special attention. Most of all, practice safety. Wear protective eye and ear wear. I also wear a dust mask to protect against fine particles. If you are new to woodworking, consider taking a class at a local college or see if your local home center store offers a woodworking course. I have taken several classes, and every time I come away a better woodworker. When looking for and if purchasing your first router, consider these features, 1 ¼ hp (minimum) both ¼ inch and ½ inch collet capacity, plunge capacity and an on/off switch that is easy to reach and operate while holding the handles. Above all, practice. The more you use the router, the more comfortable you’ll become with it. So if you’re starting to build your tool collection, consider the router. Buy a couple. The time you save will be money well spent. I know this is an old article, but I wanted to comment anyway and say thanks for the tips. I’m looking to get a wood router myself, and I know that there are important factors to consider as part of the process. When I started doing research a little while ago I realized that I needed to know more about what a wood router is and what it can actually do – this page is a great help in that regard, but it also talks a bit about the purchasing process too. 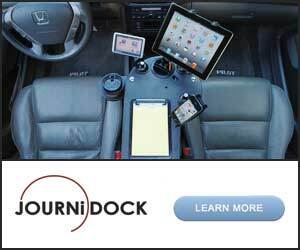 I hope you don’t mind if I share the link. What specific models of plunge router would you recommend these days? Thank you again.